looking for a built-in bench to put on her long blank wall. the Boss went to her office for some number crunching. We built a frame for the three units which would raise them up to chair height. And nobody chopped their fingers off!! There really was three units but all the pics seem to show two. To modify the center unit, I cut approx. 1 1/2 inches off the top, bottom and back piece. The side was joined to the cut pieces using regular deck screws secured to the solid wood. it tucked in neatly between the two larger units so the unfinished side was no problem. instead of rewiring the outlet, we decided to just drill a hole through the modified cupboard, add a desk grommet and a power bar. Perfect for hooking up a few glue guns for those crafting parties. 1/2 inch shim material was used so we wouldn't have to cut down the baseboard which we salvaged from the wall. A two by four was placed on the back wall (not shown). This supports the back edge of the plywood. Baseboard and plywood installed! Voila! A door, some paint and stain! The "Boss" is adorable! Just priceless! Great job, Karen! Can't wait for the next installment of the finished project! Love this, but the "boss" is just precious! 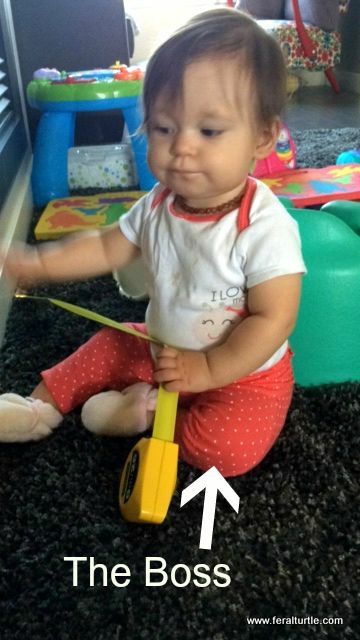 Oh my goodness...those cheeks! I love babies and it has been tto long since we have had one in our family.She is just precious and the monster outfit is too cute!!! Looking forward to seeing the finished project! I want to squish The Boss. She is as precious as they come. Your bench is pretty nice, too. Hey!!! My faraway friend! What a cutie! And a great idea for a bench too. Love it! Hi Karen, The Boss is way cute and the bench is incredible. Wonderful storage!! Looking forward to the finish. Oh my goodness, Karen, I just love reading your posts; they are informative and so fun. Of course The Boss added a whole lot of cuteness! With such a boss, you were lucky you didn't make any mistake or you would have been fired! Wow, that turned out amazing.... and the boss is adorable. Well how could you ever not seek the approval of a boss that cute! I love ikea hacks I was actually looking at the besta for something similar but got distracted by a chair for Elizabeth and well more ikea items lol. Great idea for the plug socket too. you are so handy dandy, Turtle! I couldn't use a drill for the life of me :) Love what you made in the end, so simple and yet so elegant and lovely! And goes perfect with that gorgeous dark floor. Great job on the unit! I am just imagining all the fun knick knacks and doo dads that will soon be sitting atop it! Hehehe I see you've kept yourself busy with all of your boss demands! :) She is a cutie! And as for the bench, totally awesome! Can't wait for the full reveal! I've suspected for a while that that is what bosses do behind closed doors. And now - proof! Your bench looks amazing, my friend! Will you please come to my house and make one for me? Oh please, oh please :) You are very talented and your work is stunning! You guys did a great job on the unit! I've never had a boss that cute! 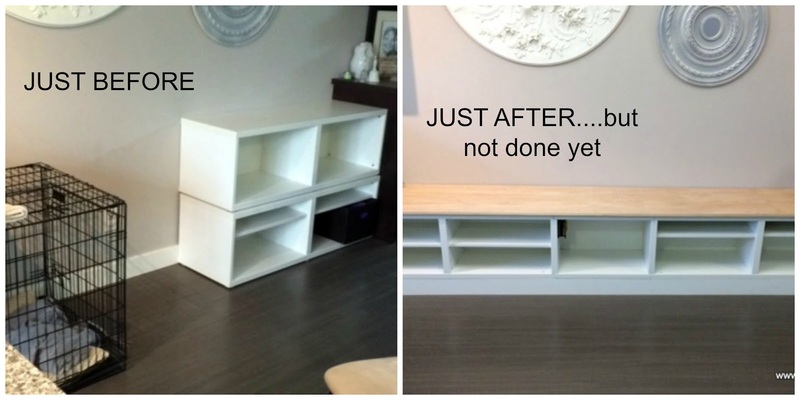 Great project Karen with great storage potential! I'm going backwards here because of that cute little " boss "
You amaze me Karen - I SO need you here for a week - can't you find a reason to come to Montreal next Spring? This is brilliant...and I love the Boss! !